If you are searching for a vegan protein powder, 180 Natural Protein Superfood is the protein supplement for you. As a vegan, you know how important it is that you continue to get the essential vitamins, nutrients,and minerals that are necessary to give your body the fuel it needs. However, you have to be more creative in supplementing your diet in order to include protein without using animal by-products. 180 Natural Protein Superfood includes only ingredients found in nature and will fit perfectly into a vegan lifestyle. Take a look at the ingredients in the 180 Natural Protein Superfood vegan formula and be pleasantly surprised to find no chemicals, no artificial additives, and no preservatives. Pea protein isolate, flaxseed, almond meal, sunflower seeds, coconut flour, chia seeds, cocoa, pumpkin seeds, sesame seeds, inactive brewers yeast, psyllium husks, and stevia are the only ingredients that have been combined to provide your body with a powerful formula. You’ll get everything you need without artificial flavourings and colours that do not belong in our bodies. 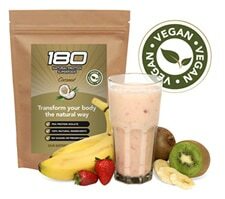 The 180 Natural Protein Superfood vegan formula can be used as a regular supplement to your diet or as a substitute for one or more meals throughout the day. Include fresh fruits and vegetables, nuts, water, and plenty of exercise to give your body what it needs. This vegan protein powder will give you steady energy levels throughout the day and you will be able to maintain a healthy weight without a problem. Consider a 180 Natural Protein Superfood smoothie made with the vegan formula. You’ll love how quick and easy it is to prepare. It is the perfect protein powder for the individual on the go who wants to make sure only the purest ingredients are used. 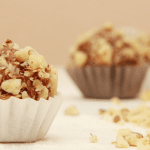 This is a protein powder that can be easily implemented into a vegan eating plan. It’s all about lifestyle choices and going with the 180 Natural Protein superfood in its vegan formula is being proactive in regards to your well-being. Try this vegan protein powder today and decide for yourself. 180 Natural Protein Superfood has been designed with your best interests in mind. Turn to the natural product that relies on plant life to give your body a good balance today. put a new spin on a topic that has been discussed for decades.